Konstantin studied in Moscow at the Russian Gnessin Academy of Music with Professors Tatiana Zelikman and Vladimir Tropp, and the Hochschule fur Musik in Freiburg, Germany with Professor Tibor Szasz. In 2008, Konstantin won First Prize at the Sydney International Piano Competition. He is the first and only competitor to date in the 40 years of the competition to win both First and People’s Choice Prizes, in addition to six other prizes. Immediately following his unprecedented success, he undertook a tour of 27 performances throughout all Australian states and territories. He partnered with the Australian String Quartet for their 13-concert National Subscription Tour of 2009 and recorded CDs for the labels Naxos, ABC Classics and Fonoforum. He has performed with the Russian National Philharmonic, the Mariinsky Theatre Orchestra, Moscow Virtuosi, Orchestre National de Lyon, Prague Philharmonia, Belgrade Philharmonic Orchestra and the Sydney Symphony among others under the baton of distinguished conductors including Vladimir Spivakov, Dmitry Liss, Tugan Sokhiev, Nicholas Milton and Alexandr Vedernikov. Konstantin won First Prize at the 2011 Klavier Olympiade in Bad Kissingen, Germany and has performed at the Kissinger Sommer festival. In July 2013, following chamber recitals with Alban Gerhardt and Feng Ning, he was awarded the festival’s coveted Luitpold Prize for “outstanding musical achievements”. He has enjoyed critical acclaim at the Klavier-Festival Ruhr, the Bochum Festival in Germany, the Mariinsky International Piano Festival, the White Nights Festival with the Mariiinsky Theatre Orchestra in St. Petersburg and the Adelaide Festival. 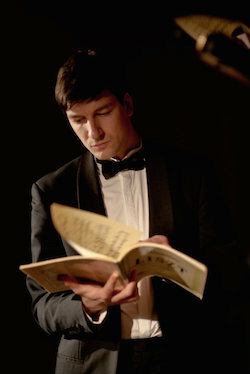 Konstantin is currently completing a PhD at the Elder Conservatorium, University of Adelaide. 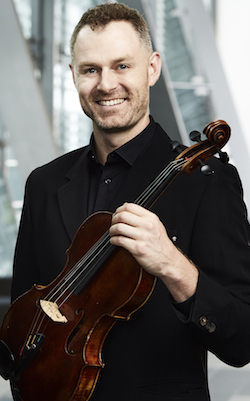 Kristian Winther studied violin with Josette Esquedin-Morgan, and conducting with John Curro, with whom he also made his concerto debut, performing the Sibelius Violin Concerto in 2000. As soloist he has appeared with the Melbourne, Sydney and Tasmanian symphony orchestras, the Auckland Philharmonic, and the Melbourne Chamber Orchestra. Kristian has also been Guest Assistant Concertmaster of the Adelaide and Western Australian symphony orchestras and the Hong Kong Philharmonic. From 2007–2008 Kristian was violinist with the Tinalley String Quartet, winning the 2007 Banff International String Quartet Competition. This was followed by critically acclaimed tours of the USA and Europe. Kristian is also a composer and premiered his work for string quartet …etude at the Sydney Opera House in 2008 with the Tinalley String Quartet. In 2009 Kristian gave the Australian premieres of Brett Dean's violin concerto The Lost Art of Letter Writing and of Andriessen's string quartet Facing Death. 2009 also saw him conducting Gubaidulina's Seven Wordsfor the Melbourne International Arts Festival in October and the Australian premiere of Andriessen's De Stijl during the Canberra International Music Festival. In 2010 Kristian appeared as leader of ACO2, and as soloist, conductor and leader of the Melbourne Chamber Orchestra. Thomas Rann is Founding Artistic Director and Cellist of Australia Piano Quartet (APQ). Since winning the prestigious Muriel Taylor Scholarship for Cellists in London (2004) he has performed as soloist with orchestras including the Melbourne, Adelaide and Queensland Symphony Orchestras and Camerata Menuhin. As soloist and chamber musician, Thomas has appeared at venues including Wigmore Hall, Tonhalle Zurich, Victoria Hall, Westminster Abbey, St. James’ Palace, Sydney Opera House and the Queensland Performing Arts Centre. 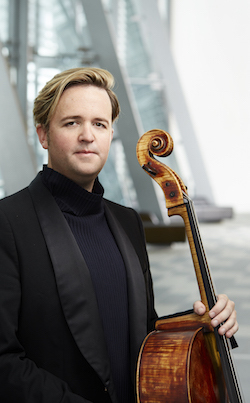 His festival appearances include the Verbier Festival Academy, the Schleswig-Holstein Festival, Sydney Festival, and the Kronberg International Cello Festival. Now based in Sydney, Thomas has been Visiting Fellow at University of Technology Sydney since 2012. Alongside his work with APQ, he has collaborated with artists including photographer William Yang, composer Elena Kats-Chernin, members of The Song Company and Ensemble Offspring, and artist Ken Unsworth, culminating in recent performances presented at the Sydney Festival and the Art Gallery of NSW. Thomas is also a guest musician with Sydney Chamber Opera and the Australian Opera and Ballet Orchestra. Thomas has studied at the Guildhall School of Music & Drama, International Menuhin Music Academy, the Australian National Academy of Music and Sydney Conservatorium with teachers including Raphael Wallfisch, Niall Brown, and Uzi Wiesel. He is grateful for the generous support of the Hattori Foundation, E.V.Llewellyn Memorial Fund, Ian Potter Cultural Trust, Australia Council for the Arts, Tait Memorial Trust, and the Henderson Bequest. 2010 by master luthier, Frederic Chaudiere. James Wannan studied viola with Alice Waten in Melbourne and viola d’amore in Vienna with Marianne Rônez. He explores his passion for music from ancient to contemporary on a number of instruments. In 2015 James performed as violin soloist in Elliott Gyger’s opera Fly Away Peter featured at the Melbourne Festival, recorded a CD of music by Jack Symonds, collaborated on five Australian premieres and toured to China with the Sydney Symphony. 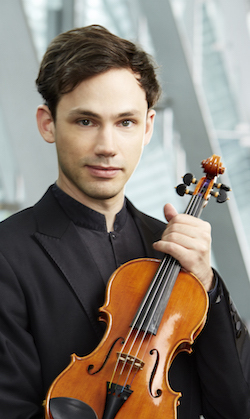 He has toured as principal violist with the Melbourne Chamber Orchestra. He has performed as guest principal viola with the Hong Kong Philharmonia Orchestra. He recently premiered a new viola d’amore concerto at the Bendigo New Music Festival.